With Readly you can read How It Works Book Of Incredible History and thousands of other magazines on your tablet and smartphone. Get access to all with just one subscription. New releases and back issues – all included. Packed with fascinating facts, and covering over 200 million years of history, this book is the perfect guide to the world around us. From the dinosaurs to the Romans and jousting to World War I, you'll discover the key moments that shaped the world into what it is today. 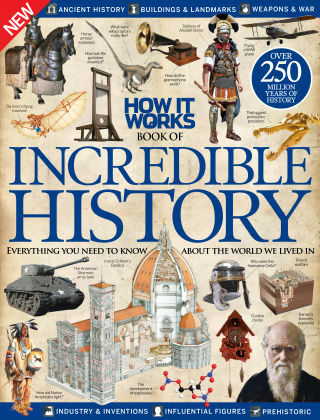 Whether you want to take a look inside Buckingham Palace, see how the Sistine Chapel's ceiling was painted, or how Da Vinci's flying machine worked, this is the perfect book to educate and entertain, with colourful images and illustrations that bring history to life. Featuring: Ancient history - Discover the Great Pyramid, the legacy of the Romans and the ancient Celts. Iconic landmarks - Take a closer look at some of the most recognisable structures on Earth. Incredible weapons - From medieval times to WWII find out how weapons have evolved over time. Amazing inventions - See how some of the greatest creations came to exist and change the world.